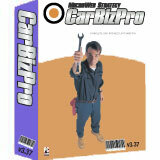 CarBizPro is a powerful mechanic shop software designed for small auto repair shops. The staff here at CarBizPro are dedicated to provide software solutions for small autorepair shops and help them promote their business online. We do this by first improving our mechanic shop software continuously thru feedback from our customers and next via promoting businesses online using web-based applications designed by MicroWeb Strategy. Let MicroWeb Strategy consultants show you how you may take your business to a higher level. 3 year Free support and updates when you purchase software online. :: buy now. Need Info? Contact Us Now!